LARGEST SIZE in its class! Includes BONUS Lemon Fragrance! Brand New!!! 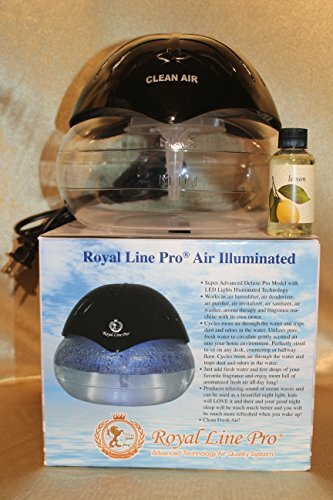 Royal Line Pro Super Advanced Deluxe Model with LED lights Illuminated technology. Works as air humidifier, air purifier, air deodorizer, air revatilizer, air sanitizer, air washer, aroma therapy and fragrance machine with its own motor. This unit has its own motor, very portable, no need to connect to the vacuum, just add water and your favorite fragrances and enjoy room full of aromitized fresh air! INCLUDES BONUS LEMON FRAGRANCE! Cycles room air through the water and traps dust and odors in the water. Utilizes pure, fresh water to circulate gently scented air into your home environment. Perfectly sized to sit on any desk, countertop or hallway floor. Cycles room air through the water and traps dust and odors in the water. Uses professional hydro-purification technology to create fresh and healthy water washed air! Removes odor, bacteria, secondhand-smoke and many other air contaminants Produces relaxing sound of ocean waves and can be used as a beautiful night light. Kids will LOVE it! And their and your good night sleep will be much much better and you will be much more refreshed when you wake up! Clean Fresh Air! LARGEST SIZE in its class! Includes BONUS Lemon Fragrance! Brand New!!! Royal Line Pro Super Advanced Deluxe Model with LED lights Illuminated technology. Works as air humidifier, air purifier, air deodorizer, air revatilizer, air sanitizer, air washer, aroma therapy and fragrance machine with its own motor. This unit has its own motor, very portable, no need to connect to the vacuum, just add water and your favorite fragrances and enjoy room full of aromitized fresh air! INCLUDES BONUS LEMON FRAGRANCE! Cycles room air through the water and traps dust and odors in the water. Utilizes pure, fresh water to circulate gently scented air into your home environment. Perfectly sized to sit on any desk, countertop or hallway floor. Cycles room air through the water and traps dust and odors in the water. Produces relaxing sound of ocean waves and can be used as a beautiful night light. Kids will LOVE it! And their and your good night sleep will be much much better and you will be much more refreshed when you wake up! Clean Fresh Air! If you have any questions about this product by Royal Line Pro, Inc, contact us by completing and submitting the form below. If you are looking for a specif part number, please include it with your message.